* All fares below were last found on : Apr 19, 2019 2:12:37 PM. Fares are round trip. Fares incl. all fuel surcharges, our service fees and taxes. Displayed fares are based on historical data, are subject to change and cannot be guaranteed at the time of booking. 60% of Calgary Airport travelers were over the age of 35. 21% of Calgary Airport travelers were over the age of 60. 7% travelers traveled to YYC with kids under the age of 14. 30% of YYC travelers were millennials. 52% of YYC travelers were female. YYZ, YVR, LAX were the most popular destinations visited by First-Class travelers from YYC. Travelers spent an average of 7.00 days in Calgary Airport. 3:00PM - 4:00PM are the busiest hours at YYC. Every week, at least 2552 domestic flights and 1737 international flights depart from YYC. 4221 flights arrive each week at YYC. 4217 nonstop flights arrive at YYC each week. The first flight to YYC departs around 7:00AM - 8:00AM. The last flight to YYC departs around 11:00PM - 12:00AM. March was the month with most bookings for YYC airport. December was the month with least bookings for YYC airport. Serving as a public airport and operated by the Calgary Airport Authority, Calgary International Airport is an international airport acting as a hub for Air Canada. The airport serves as headquarters for WestJet, it is the fourth busiest airport in Canada by passenger traffic. Some of the top destinations served by the airport include Cancun, Frankfurt, Amsterdam, London, Edmonton and many more. The airport is owned by Transport Canada and is one of eight Canadian airports with US Border Preclearance facilities. Book flights to Calgary Airport (YYC) with CheapOair! In addition to offering competitive airfares to locations most convenient for you, we provide useful information to inform your travel to YYC. Read below to learn more about YYC flights, and count on CheapOair for the best deals on all of your travel booking needs. The airport understands your transportation needs, hence offers multiple ground transportation options for an easy exit from the airport. Top major car rental companies including Avis, Budget, Dollar, Thrifty, Enterprise, Hertz, National and Alamo have their counter located on the departures level across the main terminal building. Looking for a luxurious option to travel to downtown? Top Limousine providers are available at the Calgary International Airport to serve the passengers. Other Ground Transportation options include Hotel Shuttles, Airport Shuttles, Public Buses, Taxis and Sedans. Calgary International Airport aims at providing top class facilities to its passengers, hence has many restaurants, shops and cafes located throughout the terminal building. The airport offers two lounges: Serviceair Chinook Lounge and Rocky Mountain Lounge, both of these offer great amenities and business facilities for a great stay. The Lost and Found Department is located on the Arrivals Level. 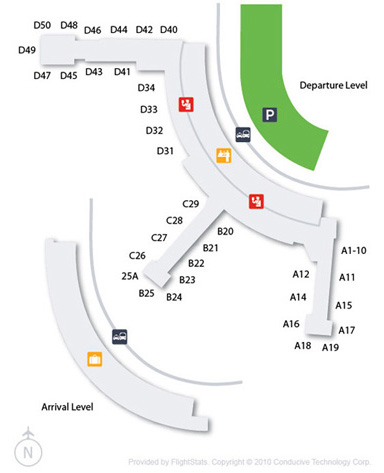 The Calgary International Airport has provisions for both Short Term and Long Term Parking. First 30 minutes in the Short Term parking lot are free, the parking lot in intended to meet and greet purpose. Payment is made at the exit gate and can be done via cash, credit or debit card. The Long Term Parking lot offers Hourly, Daily and Weekly parking options, you can park for a maximum duration of 60 days. You can only pay through Credit Card at the P2 Parking Garage. Find cheap hotels in Calgary - Lowest rates for all sorts of Calgary hotels!